The algorithmic reverb (REV), based on the well-known Overloud BREVERB 2 algorithms, is an indispensable tool to ensure the tails always remain natural and musical, even when using extreme settings. The DELAY, like the REV, is applied to the sum of the IRs. They're the ideal tools to create an abundance of space and greatly expand the tonal possibilities and usability of REmatrix. REmatrix puts no limits on your creativity, and it is so intuitive to use it actually reduces the learning curve to zero. Each one of the five IRs can be fully customized using the Extended Controls. 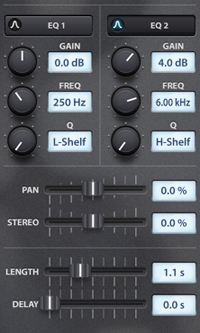 There are two fully Parametric Equalizers, EQ1 and EQ2. 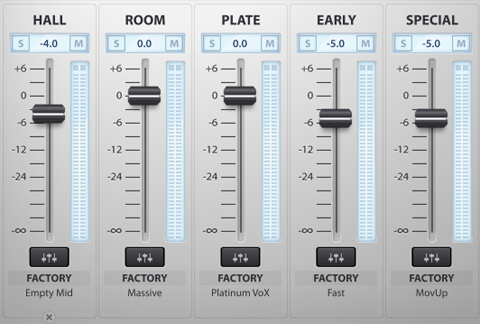 Then there is the PAN control for stereo positioning and the STEREO control to adjust overall width of the soundstage.